For years, GVF has been asked by the international disaster-response community to identify a means by which satellite-enabled systems, services, and human resources can be cost-effectively pre-positioned worldwide. In a few weeks, GVF will provide an answer to that request, and we would like to invite your organization to coordinate with us now as we prepare to launch the GVF Disaster Preparedness Communications Registry. 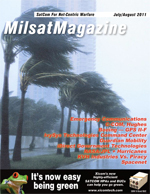 This article offers an introduction to the challenges, opportunities and advantages associated with Software Defined Radio (SDR), particularly within the field of satellite communication (satcom), and more specifically in relation to Inmarsats currently most advanced IP-service, the Broadband Global Area Network (BGAN). SDR is no longer a vision but is an opportunity readily at hand for manufacturers of military terminals and radios, software developers and SATCOM service providers. U.S. Government agencies continue to be large consumers of adaptable commercial satellite services to establish and maintain communications for their operations. In fact, according to one recent industry analyst report, commercial satellite operators provide more than 80 percent of the bandwidth the U.S. government and military uses. Why All The Interest In DVB-RCS For SATCOM Networks?, author: Richard R. Forberg, Vice President, Marketing & Strategy, STM Group Inc. Most people have probably never heard of DVB-RCS or assume it is just another military acronym. DVB-RCS is actually a commercial standard of increasing importance to military SATCOM network operators. It stands for Digital Video Broadcast with Return Channel via Satellite. Mr. Robert Tipton (Tip) Osterthaler joined the SES family in December 2006 when he became the President and CEO of AMERICOM Government Services. Since then, the independent corporation and wholly-owned subsidiary of SES WORLD SKIES has grown and integrated with other USG business elements within SES to become SES WORLD SKIES, U.S. Government Solutions. During his tenure at SES, the U.S. Government business has transformed from a product oriented sales channel into an end-to-end satellite solutions company, and now to an entity that is directly aligned with the global assets and resources available on the SES fleet of 44 communications satellites. As Vice President and General Manager of ATK Spacecraft Systems and Services (SSS), Tom is responsible for leading all aspects of the business with a team of more than 560 employees in California, Maryland and Virginia. Previously, Tom served as the Vice President of Strategy, Business Development and Advanced Systems for ATK Space Systems Group. He was responsible for managing and coordinating all activities at ATK Space Systems involving corporate business and acquisition strategy, business development, and aligning ATKs capabilities/synergies to customer requirements. John Ratigan is the President of iDirect Government Technologies (iGT), a satellite-based IP communications company that transforms the way the Department of Defense (DoD) and civilian government agencies get and stay connected. He started the Federal group for iDirect Technologies in 2003 which resulted in establishing iGT as a wholly owned subsidiary in 2007. Under his leadership, the group has enjoyed tremendous growth and has deployed thousands of terminals in support of military operations throughout South West Asia, as well as well as many civilian networks. John brings more than 20 years of experience in the satellite communications arena to the Company. Prior to joining iGT, he ran the east coast operations for Fairchild Data, and EF DATA, and eventually partnered in his own company that helped EF DATA grow from $20 million to $120 million in revenue and 700 employees between 1992 and 2000. EFDATA became the preeminent leader in SCPC satellite technology in the late 1990s and provided John the baseline knowledge and expertise that would later benefit him in his role with iGT and the migration of technology into TDMA. In addition to starting his own company, he held the position of Senior Vice president of North and South American sales for the start-up, Broadlogic, just as companies started to run IP directly over satellite. Ratigan started his career in the U.S. Senate working for Senator Bill Armstrong (R-Colorado) and eventually moved into the sales field with the Xerox Corporation as a member of the legal sales team. He holds a Bachelor of Science degree in Marketing from the University of Maryland. Scott Scheimreif brings more than 10 years of experience to the satellite communications industry as well as more than 17 years in the telecom industry working closely with the U.S. Government and particularly the Department of Defense. As vice president for Iridium Satellites Government Division, he is responsible for business development and growth of the companys U.S. Department of Defense (DoD) business sector. Scheimreif manages Iridiums relationship with DISAs EMSS (Enhanced Mobile Satellite Services) program, which provides Iridium based services to more than 30,000 war fighters and other U.S. Government users. During his tenure at Iridium, the EMSS program has increased the number of users subscribing this mission critical service by more than 173 percent. Scheimreif has also been one of the key drivers expanding Iridiums core capabilities into the U.S. Department of Defense by offering a multicast, push-to-talk voice and data service. This service, known as Netted Iridium, is envisioned by many to help satisfy the growing demand for tactical, communications-on-the-move (COTM) requirements for a variety of vertical markets, specifically the military. Mr. Brosnan is responsible for supporting U.S. Army requirements in the areas of tactical radio communications and other C4ISR systems capabilities within air, mounted and dismounted domains. He enlisted in the U.S. Navy in 1983 and was subsequently commissioned as a Naval Flight Officer from the U.S. Naval Academy in 1990 with a bachelor of science degree in ocean engineering, graduating with honors. Mr. Brosnan went on to receive a masters of engineering management from The George Washington University in 1998.He made several tours aboard USS CONSTELLATION (CV-64) and USS NIMITZ (CVN-68), deploying in support of Operation Southern Watch in the Arabian Gulf. Prior to joining Thales, Mr. Brosnan worked on the Royal Navy Type-45 Future Destroyer program in the United Kingdom. Joining Thales in 2003 to create a new Naval communications business, Mr. Brosnan has been successful in capturing Naval and maritime communications programs and broadening the companys product portfolio to include automated, integrated shipboard High Frequency (HF) communication systems. In 2008, Mr. Brosnan assumed the role of Director, Land and Joint Systems Division US. In this role, Mr. Brosnan was responsible for overseeing Thales US business in the areas of Command, Control, Communications, Computers, Intelligence, Surveillance, and Reconnaissance (C4ISR) products and systems. Mr. Brosnan assumed the role of Director, Business Development for Army Programs in 2010. Mr. Brosnans awards include the Navy Commendation Medal, Navy Achievement Medal, National Defense Service Medal, and Armed Forces Expeditionary Medal. He is also a member of the Navy League of the United States, the Association for Communications, Electronics, Intelligence and Information Systems Professionals, the Association of the United States Army (AUSA), the Surface Navy Association (SNA), and the National Defense Industrial Association (NDIA). For armed forces operating in remote parts of the globe, the ability to communicate with colleagues, friends, and family has, until now, been restricted on the grounds of affordability and lack of communication channels. However, there is nothing less than a revolution currently occurring in the world of satellite communications. As a result, it is now possible for users who spend long periods of times in these distant locations, whether on land or at sea, to benefit from the kind of high quality voice and data communications they have become increasingly used to using at home.